Emily Brown's phone rings often with friends seeking advice about money. Brown is only 26, but she already owns a house and has socked away a nice amount of money for retirement in both a 401(k) and Individual Retirement Account (IRA). Oh, and she has a renter who pays $900 a month, enough to cover her entire mortgage. As her friends and family like to say, she's "got it figured out." Brown doesn't work on Wall Street or Silicon Valley. She's an accountant in Cleveland, Ohio, who bought her home at age 25 when she earned about $50,000 a year. Friends tried to convince her to live closer to "the action" in downtown Cleveland. But she did her research and realized that between the high rent and paying for parking, it wasn't worth it. So she instead chose to buy a "fixer upper" home for $107,000 in a suburb. A tenant was already living in part of the duplex home. Brown was happy to extend the lease and have her stay. Only about 20% of Americans own their home by age 25, according to the Census. She credits her financial savvy to three things: Parents who stressed frugality, reading the book "Rich Dad Poor Dad" and going to college during the Great Recession. "Living through 2008 and seeing people lose their jobs taught me you have to prepare for anything," Brown told CNNMoney. "I wanted a game plan, not living paycheck to paycheck." 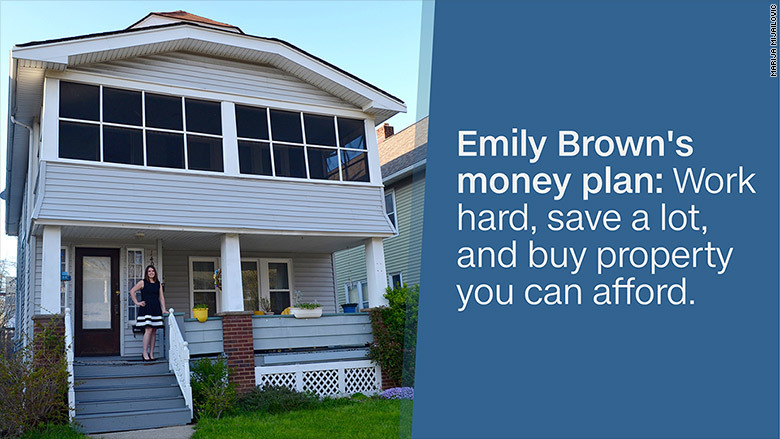 Her money plan is simple: work hard, save a lot, and buy property you can afford. It's hardly a novel idea. Way back in 1758, American founding father Benjamin Franklin wrote an essay called "The Way to Wealth." His conclusion: "If you would be wealthy, think of saving as well as getting." She has budgets for everything and works hard not to go over. Much like eating healthy, Brown views money as a choice you make every day. She drives an older car, a 2009 Ford Escape SUV with "a big old dent." Friends joke that she doesn't come out for drinks after she's spent her fun budget. And student loans? Brown has those too. She borrowed about $35,000 to attend Baldwin Wallace University in Ohio. She worked jobs in college, managing to pay down about $6,000 of her loans while still in school. Since graduating in 2012, she's continued to pay more than the amount due every month. Her balance now is just $10,000. But Brown says her biggest "a-ha" money moment came from starting an IRA. When she was in high school, she worked at an ice cream shop called Dairy Dock in Vermilion, Ohio. At age 18, she had about $100 saved from her pay. Her father suggested putting it in a saving account or certificate of deposit ("CD"), but the interest was so low -- nearly 0% -- that the bank recommended Brown open an IRA and consider investing the money in a stock market fund. "I thought it was the craziest thing I had ever heard," Brown admits about starting a retirement account at age 18. "But those little amounts have grown immensely." In 2008, as Wall Street was in meltdown mode, Brown started university and majored in finance and accounting. Her professors stressed saving and investing early, so she kept putting money into her IRA from her summer jobs and internships. After graduating college in 2012, she landed a full-time job as an accountant and began to put $250 a month away in her IRA religiously. At her current job, she also opened a 401(k) retirement plan and contributes 6% of her salary, which her company matches. Brown's smarts and financial maturity even impresses the pros. When Yvette Butler, president of Capital One Investing, hears of Brown, her reaction is: "She's my idol ... I wish more of us started saving for retirement at 18."